Samsung Electronics is a global leader in semiconductors, telecommunications and digital media technologies, and one of the most valuable brands in the world. Headquartered in Suwon, South Korea, the company was founded in 1969. Samsung employs more than 300 thousand people worldwide and spends about 15 billion U.S. dollars on research and development each year. Samsung also ranks amongst companies with the most U.S. patents granted. Samsung is the leading smartphone vendor worldwide. In 2016, Samsung's market share of the global smartphone market was at around 20 percent with Apple as its closest competitor in the market. In 2017 alone, the South Korean company sold more than 300 million smartphones worldwide. Next to Apple Huawei, OPPO and vivo are currently Samsung’s main competitors in the smartphone market. Samsung also holds a sizeable position in the tablet computer market with the Android-powered Samsung Galaxy Tab, competing against Apple’s iPad, for example. 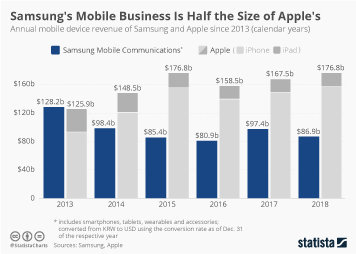 In early 2017, Samsung held the position of the second largest tablet vendor in the world, accounting for around 16.5 percent of all shipments. Apart from having a strong presence in the mobile market, Samsung is also successful in the display, TV and semiconductors industry. Samsung has been the world's largest television manufacturer since 2008, when the company held a 20 percent share of the global LCD TV market. Samsung’s market share has stayed rather consistent in the last few years, varying between 19 and 21 percent. The South Korean giant is also the world's largest producer of LCD panels, and has the greatest share of the global market for NAND Flash memory. Lastly, Samsung has a strong presence in the global semiconductor market; it surpassed Intel to become the market leader in 2017, with a market share of 15 percent.